You can never judge a book by its cover, so the saying goes. However, there are exceptions. And this book is one of them. It was the picture on the front that originally attracted me. I don't usually buy celebrity biographies. I'd not read one since Russell Brand's My Booky Wook (please don't judge me, it was a Christmas gift). I'm not bothered either way about the genre. But there's something about that ginger man in black NHS specs grasping a green cocktail that caught my eye. For the record, I think the jacket is genius. It's geeky, cool, edgy, bright, attractive and humorous. 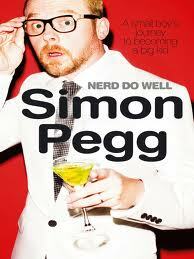 In fact, everything you kind of think Simon Pegg is. Well, maybe not all of them, but you know what I mean. Pegg's writing bounces along. He switches between a roughly chronological account of seminal moments in his life, where his love of geekery, performance, comedy and film cemented the foundations for his future career, and a fictional account of his super hero alter-ego who grapples (in every sense of the word) with the evil Lord Black and the beautiful thief, Scarlet Panther. He deliberately avoids detailing his current family life and uses pseudonyms for old flames that he wants to protect. He focuses more on anecdotal recollection of amusing and symbolic moments. All told with his usual humorous skill. So the first book I read in 2011 gets a massive, geeky, bespectacled, sniggering thumbs up.